Loksatta Party national President Dr. Jayaprakash Narayan today termed Congress Vice President Rahul Gandhi’s promise to waive farmers’ bank loans of up to Rs. two lakh as irresponsible. Addressing a media conference, Dr. JP wanted to know whether the loan waiver would be applicable to farmers in both the emerging States. Who would foot the bills – the Center or the States? Had any homework been done on the implications? Had the Reserve Bank of India been consulted? Dr. JP asked who had given the authority to the Congress to announce a decision that disrupts the economy. What would happen if the RBI imposes a freeze on grant of bank loans to people in the State taking exception to the Government’s credit indiscipline? Dr. JP said he had earlier voiced concern over regional parties making wild promises unmindful of their deleterious consequences. Now even a national party like the Congress has placed its interests above those of the country. Farmers, Dr. JP said, should definitely be extended all assistance in the form of improved seeds and modern technology. They should be ensured remunerative prices for their produce. 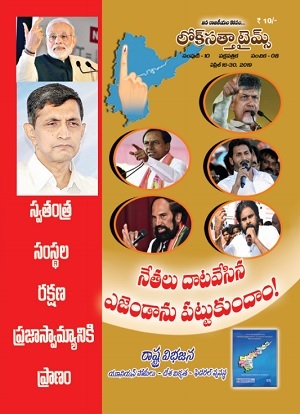 The Loksatta had enabled farmers to gain Rs.3600 crore during 2011 by successfully agitating for removal of the illegal ban on inter-State food grain movement. The Loksatta again was responsible for getting the ban on export of food grains to other countries as a result of which farmers have been receiving higher prices and India has emerged as the No.1 exporter in the world. The Union Cabinet decision to dissolve the Andhra Pradesh Assembly and re-promulgate President’s rule is a sad commentary on the functioning of the Government of India. That Chief Minister N. Kiran Kumar Reddy would resign in the wake of the promulgation of the AP Reorganization Bill was an open secret. The Parliament was in session when the CM resigned, and its approval could have been taken for imposition of President’s rule. The Union Government behaved like a tottering child or a somnambulant man. Now we have presidential rule which is unconstitutional, but without remedy Dr. JP appealed to youth to enlighten voters to vote freely without submitting to inducements or coercion since votes are not counted booth-wise. The EC is bunching EVMs and vote count is known only for a group of booths. Therefore, there is no opportunity for candidates to know how people voted in a particular booth. Referring to the daily seizure of money and recovery of liquor stored in fields and ponds, and publication of paid news, he asked media to enlighten voters on the pernicious practices and not become a part of the rotten system. Dr. JP announced he would campaign for Mr. Bandaru Dattatreya, BJP Lok Sabha candidate from Secunderabad on Sunday morning in response to a request from him. 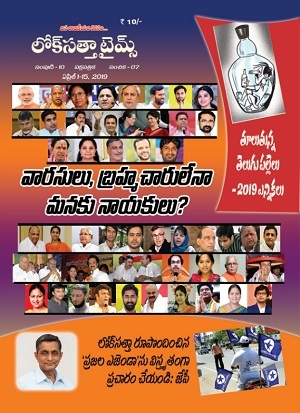 State Loksatta Party President Katari Srinivasa Rao read out an open letter to voters by lyricist Sirivennela Sitarama Sastry to support the Loksatta and stand for dharma. Party leaders Bandaru Ramamohan Rao, V. Vijayender Reddy and Kodandarama Rao took part in the media conference.